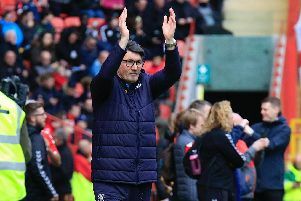 Luton Town failed to make any real inroads to the top three once more after being held at home in an engrossing clash against fellow promotion-chasers Carlisle United this afternoon. The hosts started the game seven points behind their visitors, and that's exactly how the gap remained at the final whistle, thanks in part to some horrendous and downright cynical time-wasting tactics from the Cumbrians. Every chance they had, they delayed putting the ball back into play, taking an age over every single set-play, and just generally spoiling the game from well inside the opening 10 minutes. They were eventually reduced to 10 men late on as Michael Raynes saw red for an elbow on Danny Hylton, but Hatters couldn't find a way through, as Nathan Jones' side remained fifth in the table. Town's chief surprisingly went away from his standard diamond formation for the first time this season, recalling Stephen O'Donnell and Dan Potts back in as wingbacks, while Isaac Vassell made it three pronged attack alongside Hylton and Jack Marriott. Jones had spoken in the week about learning their lessons from both Solihull and Swindon matches where they fell behind early on, but clearly Town hadn't, undone with five minutes on the clock. Shaun Miller's header should have been routine for Christian Walton, only for the keeper to make uncustomary error, spilling the ball out for Jason Kennedy to tap into the net. However, as they had done at the County Ground on Tuesday night, Luton weren't behind for any great time, level on 10 minutes when Potts was give far too much space to maraud forward. He fed Vassell, who played in Marriott, the striker crossing for Hylton to show great strength in handing off his marker, firing beyond Gillespie, who got a touch, for a 14th of the season. Alan Sheehan's shot low was easy enough for Gillespie on 18 minutes, with Nicky Adams then testing Walton, who tipped over. Midway through the half, Hatters had a magnificent opportunity to move ahead, as O'Donnell's wonderful first time cross was perfect for the completely unmarked Marriott at the back post. However his downward header bounced straight into the ground and bounced up for Gillespie to gather under his own bar. Hylton went alone from 25 yards, blazing wildly over, when O'Donnell was a better option, while Vassell saw two tame efforts roll wide after utilising his pace and desire to pick the Cumbrians' pockets. It was Luton who making the better chances though, in one of the best first half displays this term, as Marriott looked for all the world like he had put Town in front on 40 minutes, measuring a left-footed curler, but it went millimetres wide with Gillespie a mere spectator. After the break, Rea had a swerving effort that was saved by Gillespie, but United, despite their continued intent to run the clock down, looked dangerous when actually trying to score, Shaun Miller's twisting volley too high. Luton could never quite regain the intensity that showed in the first period, as United had the better of open play, although McGeehan almost bundled his and the ball's way over the line, but was eventually bravely stopped by a combination of Gillespie and Danny Grainger. Scott Cuthbert should done better with a header from Alex Gilliead, on for the injured Sheehan's corner, rising highest, only to power his effort wide. Kennedy's overhead volley was easy for Walton, before the game's flashpoints began occurring, Shaun Brisley seeing yellow for hacking down Hylton. The defender should have gone moments later, for clipping Town's leading scorer again, but it was his centre half partner Michael Raynes who saw red on 80 minutes, for an elbow on Hylton, picked up by the assistant referee. Frustrations boiled over in the dug out too, a member of the visitors' coaching staff sent to the stands too, as when it had all calmed down, McGeehan's free kick was parried by Gillespie. Rea fired over the top, while Vassell couldn't quite sort his feet out in the area, as despite having plenty of the ball, Luton just couldn't work out a way in which to break their opponents down. They almost paid a hefty price too, as with nine minutes of stoppage time added, Carlisle should have won it, when Adams was first to Luke Joyce's cross just eight yards out, only for Walton to redeem himself, making a crucial save with his legs to prevent a defeat that would have been incredibly harsh on the Hatters. Hatters: Christian Walton, Johnny Mullins, Scott Cuthbert, Alan Sheehan (Alex Gilliead 62), Stephen O'Donnell, Glen Rea, Cameron McGeehan, Dan Potts, Isaac Vassell (Jordan Cook 90), Danny Hylton, Jack Marriott (Pelly-Ruddock Mpanzu 67). Subs not used: Craig King, Jonathan Smith, Olly Lee, Josh McQuoid. Carlisle: Mark Gillespie, Danny Grainger (C Macaulay Gillesphey 70), Luke Joyce, Michael Raynes, Jason Kennedy, Mike Jones (Reggie Lambe 34), Charlie Wyke, Nicky Adams, Shaun Brisley, Shaun Miller (Jamie Devitt 80), Tom Willer. Subs not used: Mark Ellis, Derek Asamoah, Max Crocombe, Alex McQueen. Booked: Rea 3, Mullins 54, Brisley 57, Gillespie 67.